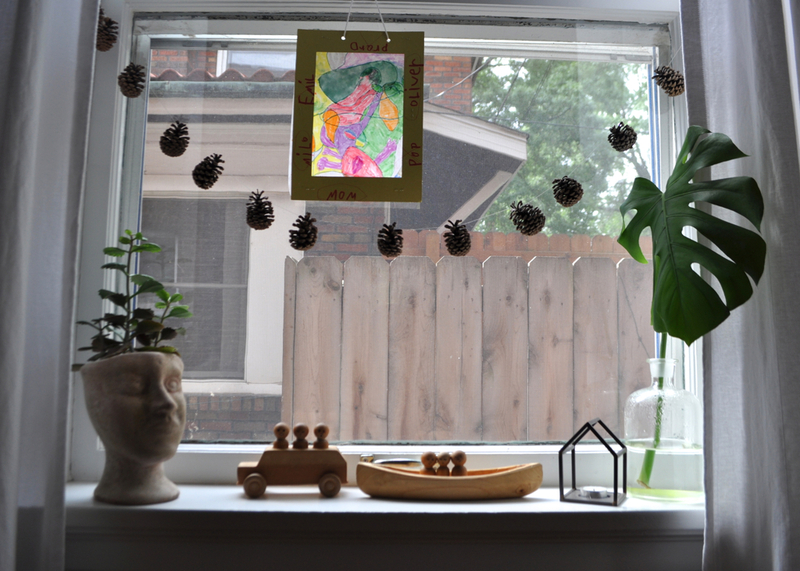 Since all three boys have started Montessori school, I have been trying to make our home environment more consistent with what they are used to during the day. I think doing so will help them move seamlessly between both worlds, and aside from that, the theories behind the set up and materials just make sense to me. It was a such a pleasure to attend an hour-and-a-half long parent education at the boys’ school recently, where I learned more about the Montessori home environment. 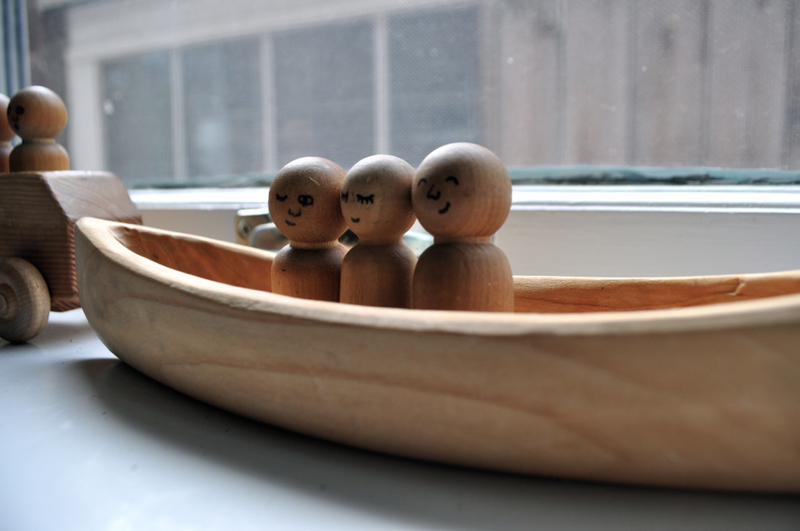 I thought I would share some tips about bringing Montessori home if you’re interested in the method. And even if you’re not, some of the tips might be helpful anyway if you have small children. Starting off with young children in Montessori, there is a great emphasis on practical life: activities that center around skills such as pouring, cutting, washing, folding, baking, ironing, dressing and grooming, polishing, and sewing. All of these activities build the foundation for self-care, self-confidence, and also aid in lengthening and strengthening concentration. Making some of these activities accessible at home means making them within reach and easy to see. Something that stuck with me was the thought that when we move into a house, we spend a lot of time thinking about how we adults want our house to look and feel: where to put the couch, which cabinets the dishes will go in, etc. But our children live here too, and making things comfortable and functional for them as well as for us is an important way of including them. 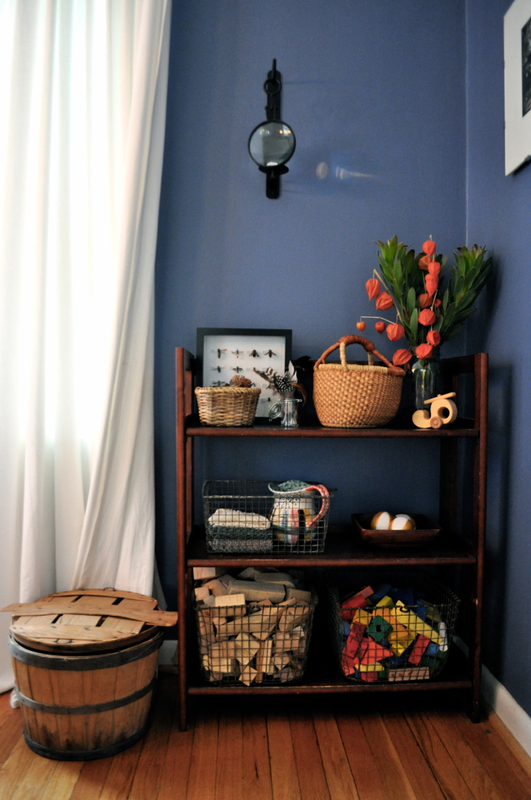 While we don’t have the amazing materials of a Montessori classroom in our home, I like the idea of setting up similarly in our main living areas. 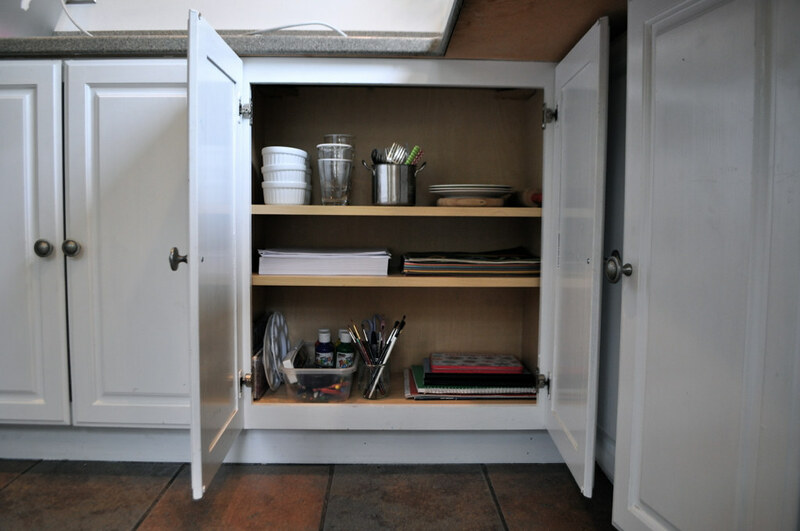 This includes some spaces with open shelving, keeping their things within reach, and rotating items so there are only a few things out at a time. 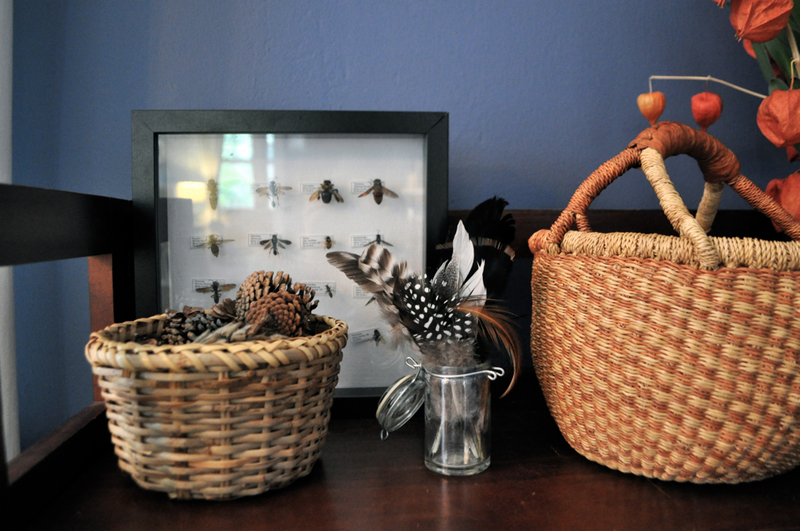 Above, their shelving unit in the dining room includes their ever-growing feather collection, pinecones they have collected from the neighborhood, and in the basket is an enormous collection of Pokemon cards, ha! Below that is a pitcher and washcloths (thanks, Julie!) for pouring or washing activities. 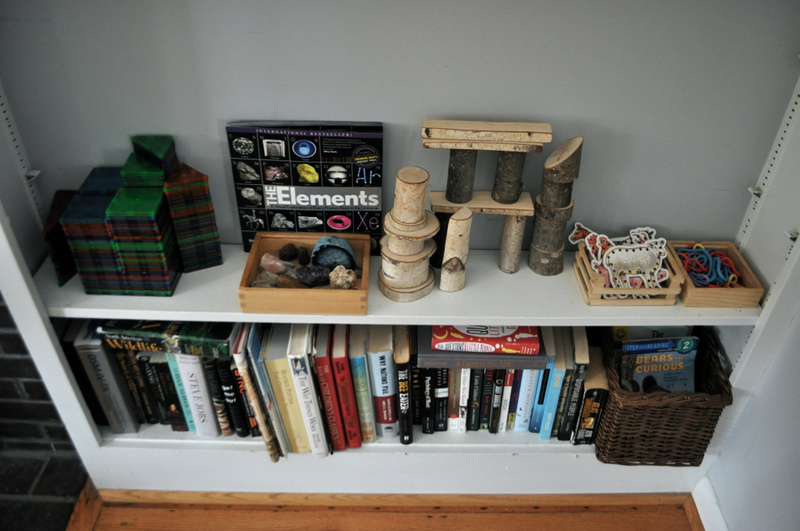 The bottom shelf holds wooden blocks. In the living room beside the fireplace, we cleared off a shelf for their magna tiles, stone collection, natural building materials, and lacing cards. Small wooden trays keep collections nice and neat. Avoid crowding the shelves. 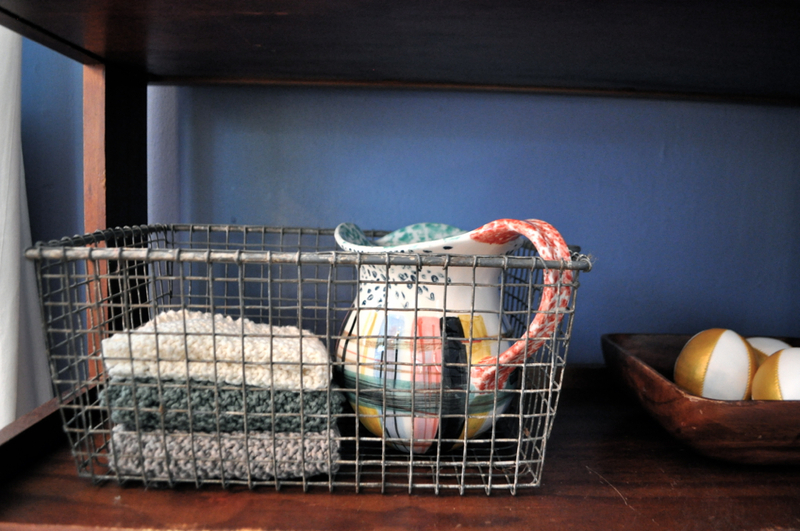 There should be a clear place for everything — that is also a bonus when it’s time to clean up; it’s obvious where each item goes! 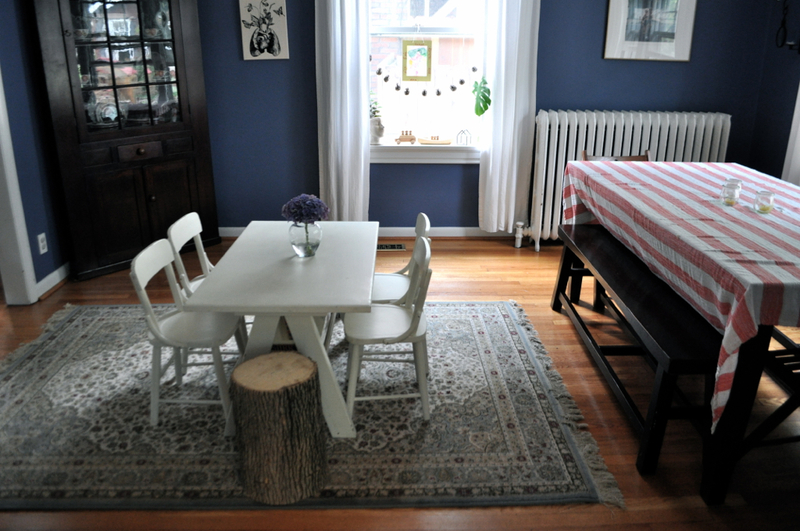 Child-sized furniture is great if you have the space. 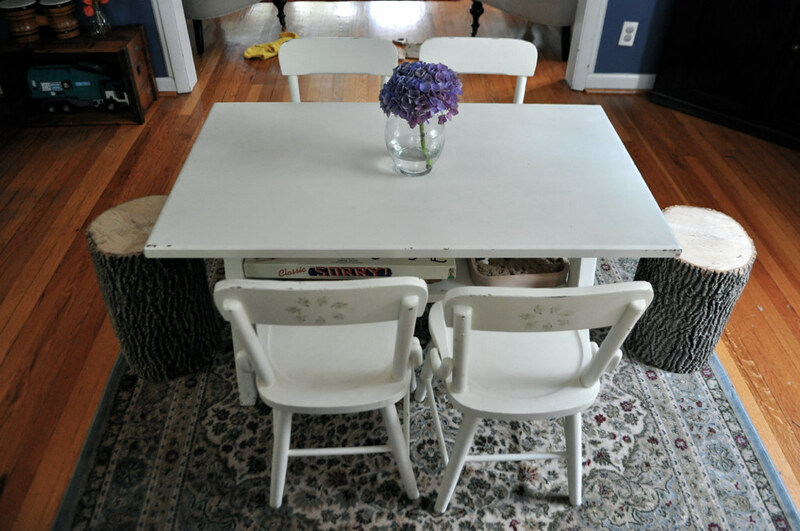 Our boys eat, play with sand and play dough, play Sorry and chess, line up little animals, draw and write at this table. It’s pretty great to see them set the table before dinner and clear it off after. It’s their own space and we encourage them to take pride in that! In the kitchen, we have a low cabinet solely for the kids. 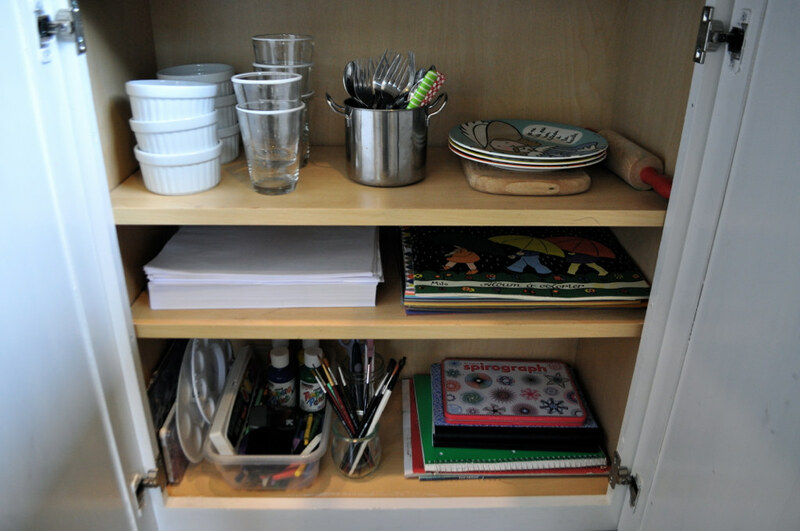 It holds their glasses, snack and cereal bowls, child-sized utensils, and a small cutting board and rolling pin on the top shelf. The middle shelf is just for paper — a hot commodity around here! And on the lowest shelf are a few art supplies like paint, paintbrushes, colored pencils, crayons, scissors, and notebooks… but whew, you should have seen this area before — a total wreck, jam-packed full of stuff so overwhelming that no one could find anything, therefore no one used anything. Upon arriving home from school just after I reorganized this area, the boys immediately helped themselves to pumpkin bread; Milo cut three pieces while Oliver got the plates. Emil got forks for everyone and they met at the little table. I’m pleased to say that I had nothing to do with any of it. Hooray! I put away a good deal of other art supplies and will rotate them in once the boys fall out of the habit of using what’s already out, or if they request something in particular. 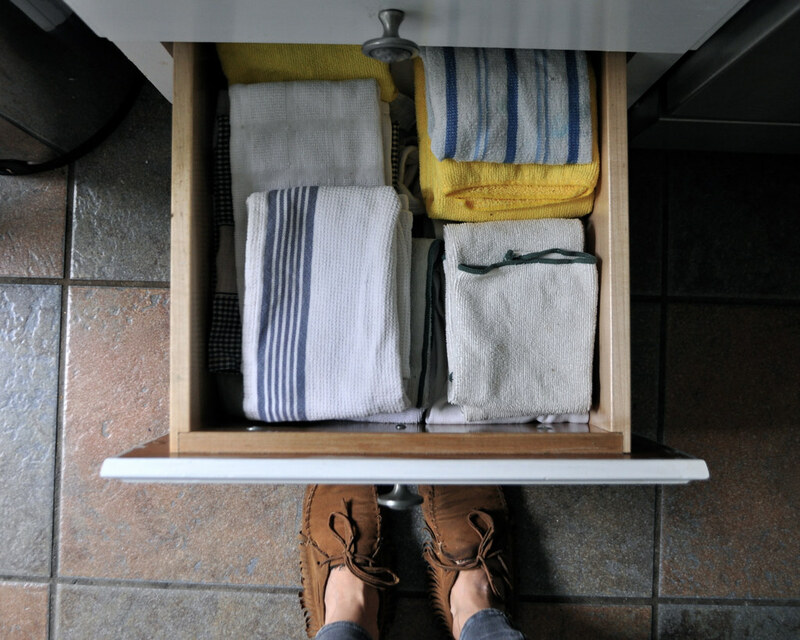 And below, towels for cleaning up messes or drying hands are in our lowest drawer and always have been. Emil runs to the towel drawer after a spill and then returns the wet/covered-in-yogurt towel back to the clean drawer… oh, well. We’re working on it! I am really interested to see if these changes in our home environment have an effect on the independence of the boys and also on the smoothness of our morning routine, which feels a bit rushed as we have to get out the door so much earlier than we did last year. Either way, I’m really happy with the more organized state of our downstairs, so I’d say it’s already been a success! Such great ideas, I’ve been working on making things more accessible to my boys as well, these are some great ideas. The towel drawer is really great! Love this and sharing with my sister!! your home is so very peaceful! Love love! Ruby is still a tornado, and I find i can’t yet put everything as accessable as I’d like. I know I have seen montessori materials with babies her age sweetly folding things and pouring pitchers of water… But she crashes everything to the ground. She can drink from a cup and eat soup with a spoon though 😉 I leave some snack prep stuff for W up on our main table, where he can reach it and she can’t. I definitely want to get that low towel drawer going over here- brilliant! I’m thrilled to know we aren’t the only one with a yogurt covered/slightly damp towel drawer. I’m thrilled when Maddy independently cleans up a mess and inwardly cringe when she also “cleans up” the towel. We are working on her knowing to put dirty ones in hamper on her own! 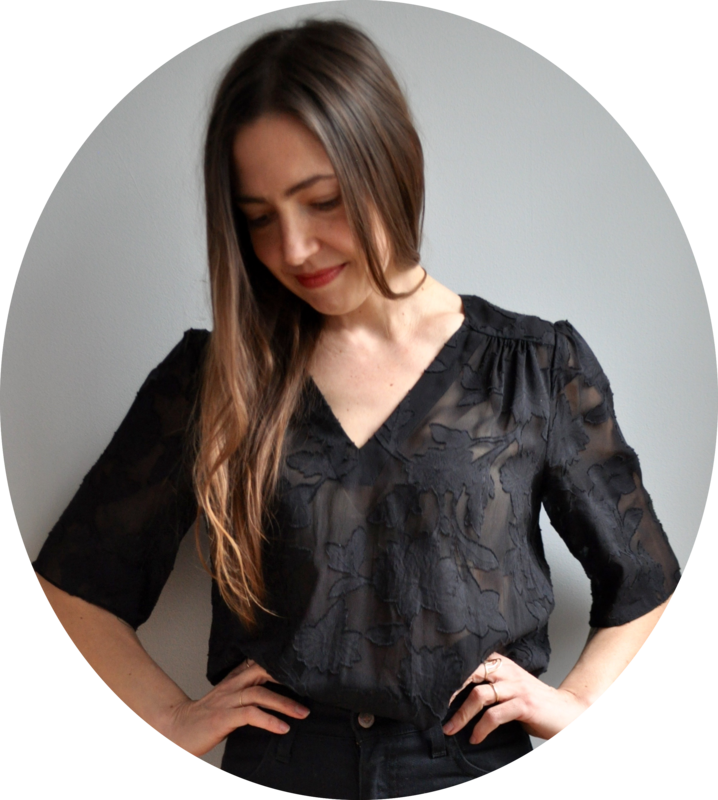 Loved your house and your blog. Where did you get that kids size table? I would love that for my boys.